On Wednesday, Time announced its 90th Person of the Year—the individual who, in the magazine’s editorial staff’s view, had the “greatest influence, for better or for worse, on the events of the year.” Unsurprisingly, the winner of the title was Donald Trump. In her piece announcing the decision, Managing Editor Nancy Gibbs wrote that for some, Trump’s victory “represents a long-overdue rebuke to an entrenched and arrogant governing class;” for others, “the destruction extends to cherished norms of civility and discourse, a politics poisoned by vile streams of racism, sexism, nativism.” Either way you slice it, Gibbs argues, Trump enthusiastically disrupted our modern political system, and for that, he proved his unparalleled influence. The Trump name, as innumerable essays have breathlessly declared, has certainly become synonymous with a certain kind of desperate, malcontent outsiderism—a gaudy display of wealth perpetually peering through the windows of the conference rooms where the real adults make real decisions. And in his campaign, Trump successfully rebranded his decades-long desire to be an insider into the fact that he wasn’t. But Trump’s political future was a fantasy until he realized he, or anyone, could mobilize a politically dormant but vitriolic force in the populace. Trump found his real influence when he empowered his staff—people like Steve Bannon and Corey Lewandowski—who tapped into a demographic of voters who felt they’d been abandoned by U.S. politics with the passage of the Civil Rights Act. 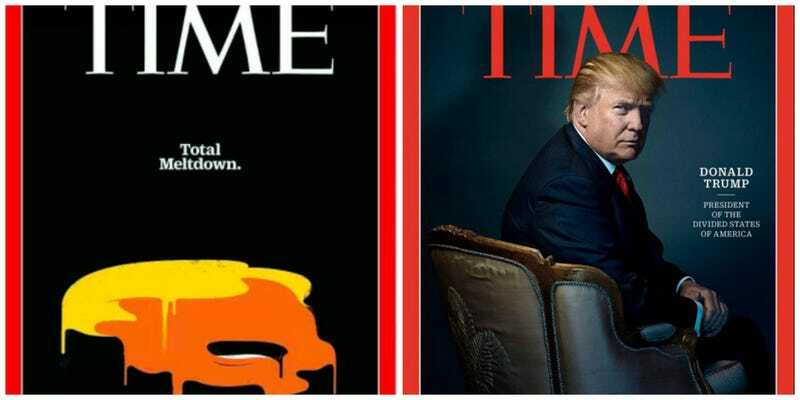 Not even two months ago, Time published the second version of its “Meltdown” Trump cover by artist Edel Rodriguez. The cover referenced the then-candidate’s bizarre behavior while paying homage to his cartoonish qualities. The cover acknowledged Trump was a line drawing of outsized ego, hair-trigger temper, and inexplicable orangeness. What’s changed since then, other than an election that was more about anger than it was about the specifics of what people were angry about? “Person of the Year” is not necessarily an honor—Trump now shares the title with Adolf Hitler, Joseph Stalin, and Vladimir Putin, among others—and most U.S. presidents have been named it. And, as Twitter user Gabriel Knight pointed out, Trump’s cover might be paying homage to a 1941 cover of the magazine. Still, to ascribe this outsized power to Trump, the man who cancels his intelligence briefings, who hands the phone off to his daughter when asked about women, who finds time to watch hours of sketch comedy without fail every week, is to miss the forest (of white nationalists, of jilted men, of the large swaths of the country that have seen only a handful of brown people in decades) for one excessively spray-tanned, sun-blocking tree.